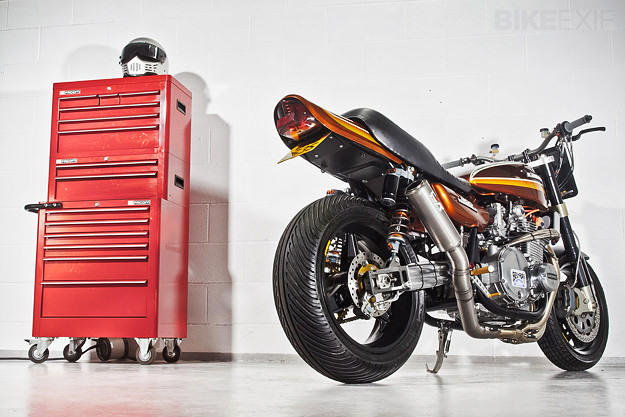 The British firm Racefit creates beautiful titanium and carbon end cans, and full titanium exhaust systems for discerning sportsbike riders who still believe loud pipes save lives. The company is based in Derbyshire—home to some of the best and most heavily policed riding country England has to offer. 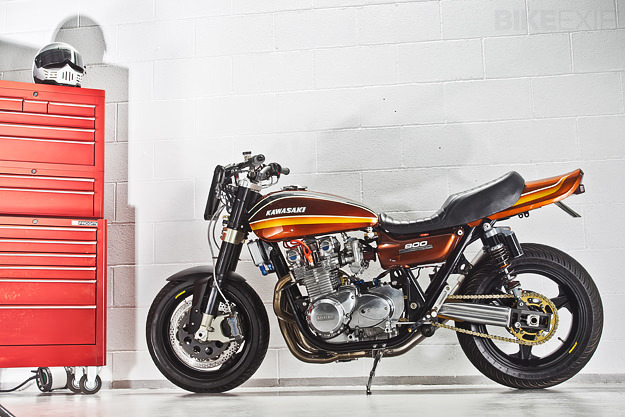 Co-owners Jon Keeling and Phil Atkinson have been immersed in high performance bike culture for years and this Spondon-framed Kawasaki Z1 is the latest in a long line of high-performance, four-cylinder specials. 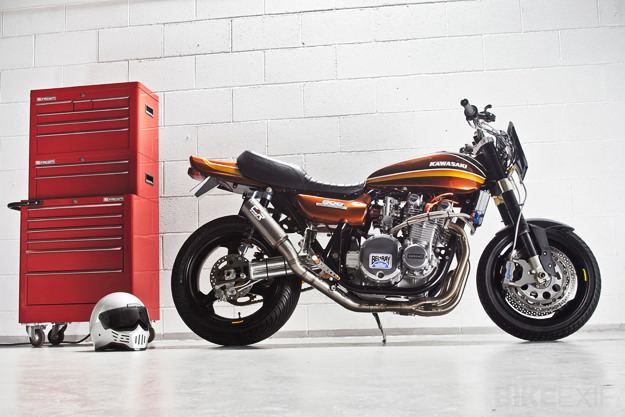 Keeling bought the Kawasaki Z1 as a part-finished project. He then completely stripped it and fitted a new front end, brakes, wheels, rear suspension and exhaust system. 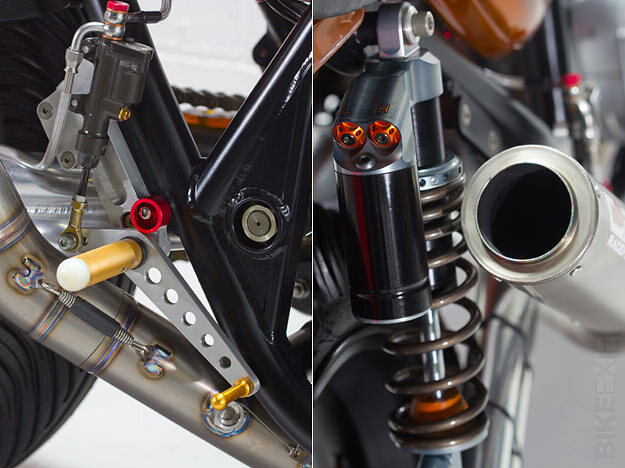 The former owner, Mark Toon, had sold the Z1 to start up his own precision motorcycle parts business RCD, and he made many of the brackets and mounts for the bike. The bike’s chassis is a big-tube Spondon aluminium duplex with a tubular, twin shock swingarm. When building bikes Jon tries to avoid the obvious brands, so the front forks are enormous and fully-adjustable Marzocchi RAC 50 legs, while the rear shocks are WP Stereo Spin Fusions. The wheels are British-made Dymag H-sections. The front is 16″ diameter and the rear 17″, while the front discs are rare 320mm Spondon items. Those large discs and the unfashionably small front wheel give the stance Jon demands, but the discs must be loosened to allow the AP Lockheed radial calipers to be removed. The master cylinder is a MotoGP spec Brembo, bought from a now-defunct GP team. Nothing, from the GSX-R1000 tail light, through the Mil-Spec loom and Steve Adams seat, to the Stack tacho, is standard about this Zed. The paint is no exception: a deluxe version of the original root beer scheme was laid-on using House of Kolor candies. The engine has had a very thorough and costly rebuild with Wiseco pistons, Kent cams and extensive headwork. 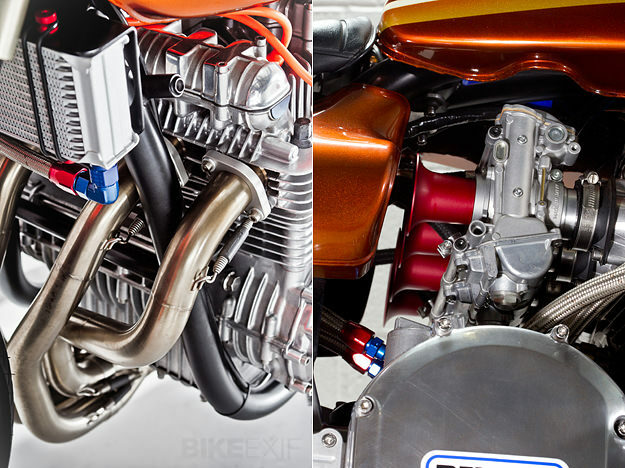 Carbs are 32mm Mikuni TMRs, while the titanium exhaust uses headers the project came with, mated to a Racefit Legend link pipe and end can. 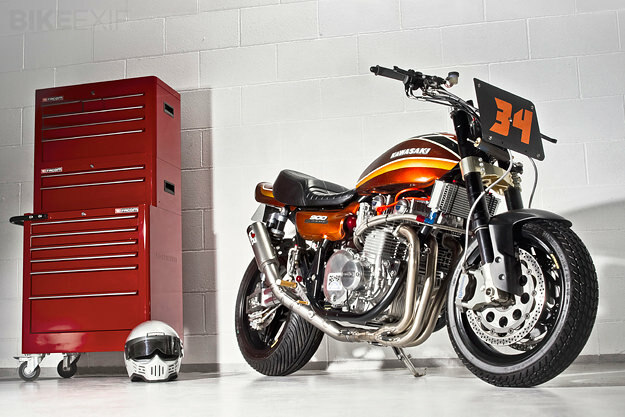 ‘The bike is a super-evolution restoration,’ explains Jon, coining a phrase I’ll use again. Racefit sell end cans from £400, though the minimal titanium Slash is £150. A full Ti Legend, made to-order, starts at £1500, while a Spondon-framed Zed with a fat motor, like this bike, would cost from £15-20,000, depending on specification. Using something like a GSX1100 ET or EFE donor bike, then bracing and jigging the standard frame, would drop the price closer to £10,000. With thanks to Gary Inman of Sideburn Magazine and Paul Bryant of Kinetic Images. Head over to the Racefit website for more high-spec performance parts. Steve Smethurst vapor blasted cases, block, head etc.